There was a time when the Infosys’s quarterly results set the tone for the $150 billion Indian IT service sector’s performance. The bellwether’s numbers influenced not just its own shares but even the benchmark IT indices on Indian bourses. But on Oct. 24, when the country’s second-largest IT company posted its financial results for July-September 2017 (Q2), the spotlight wasn’t on its net profit or revenue. Instead, it was mostly on the tussle between founder NR Narayana Murthy and the newly-appointed leadership. Not surprisingly, the company’s management spent a significant part of the post-earnings press conference around allegations raised by an anonymous whistleblower and Murthy. However, their efforts to put the episode behind failed. Because, later in the day, Murthy put out a statement expressing his “disappointment” at the functioning of even the new management. Needless to say, he’s been unhappy for months now, constantly questioning the company’s management, old and new. This prolonged tug-of-war has tired out shareholders and analysts. A number of them, while respecting Murthy for co-founding one of India’s most successful ventures, have had enough of this public mudslinging. They want Infosys to focus again on executing orders, winning new contracts, and maintaining employee satisfaction. “If there’s something in the news every other day, the management ends up spending a lot of time in dealing with the press, clearing the air, and sharing its point of view. That cannot be good for any company,” said Amit Tandon, founder and managing director at proxy firm Institutional Investor Advisory Services (IiAS). 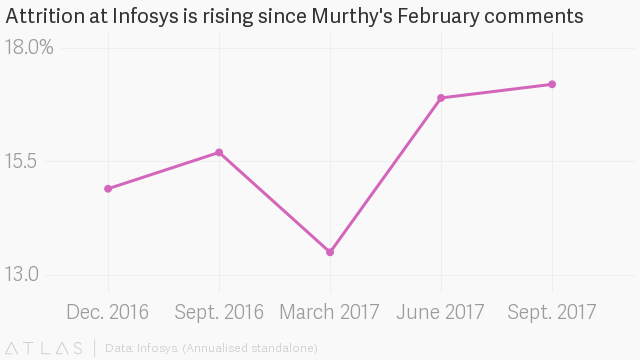 Since the beginning of this year, Infosys has been in the news for all the wrong reasons. Between then and August, several other co-founders voiced similar concerns over corporate governance at Infosys. On Aug. 18, CEO Vishal Sikka unceremoniously quit Infosys, citing “the constant drumbeat of the same issues over and over again.” Chairman R Seshasayee and independent directors Jeffrey Lehman and John Etchemendy also resigned from the company. There were other top-level exits, too. This turmoil may even have weighed on employee morale, leading to an uptick in attrition. “The Infosys founder (Murthy) has always claimed the high moral ground on good governance. But by taking on the current board in a high-pitched boardroom battle, he may have violated his own tenets and weakened the institution,” former Infosys independent director and management consultant Rama Bijapurkar wrote on Aug. 20. It’s not just Infosys that may end up suffering. The entire industry stands to get a bad name, argued Sanchit Vir Gogia of Greyhound Research. The Indian IT industry is going through a tough phase due to changing technologies and cautious spending by clients. Infosys had brought in Sikka in 2015 to arrest the decline in its growth momentum as it continued to lose out to competitor Tata Consultancy Services (TCS), the country’s largest IT services firm. Sikka, the first non-founding CEO, overhauled the Bengaluru-based company’s strategies, sharpen the focus on the high-margin software products business rather than focusing on low-end jobs. Under Sikka, Infosys also increased its pace of inorganic growth and undertook some subtle cultural changes such as allowing social media access and casual dressing for staff. And while Sikka’s efforts had begun showing some results, by the time of his exit Infosys had not yet regained its industry-leading growth pace. Last week, the company reduced its revenue growth guidance to between 5.5% and 6.5% for the current financial year—that’s down from between 6.5% and 8.5% that it was initially aiming for. The new estimate is far lower than the up to 8% growth that Nasscom expects for the overall industry this financial year. Although Nilekani’s broader strategy for Infosys is yet to be unveiled, the one thing most observers were hoping for was an end to the conflict between the co-founders and the management. But that looks distant now. Analysts are concerned that this public questioning by the founders will never let another CEO be effective. “The crucial question, though, is whether the group of founders will continue to interfere in public or whether they finally take a back seat and demonstrate confidence in any incoming CEO and his executive team. If the latter is not being addressed, any new king will wear very old clothes,” US-based tech research firm HfS said in a note. Other stakeholders, too, are now hoping that Murthy’s tirades will end soon.